The Irish Language is a Celtic language spoken in mainly Ireland (Éire). There are also Irish speakers in the UK (Ríocht Aontaithe), the USA (Stáit Aontaithe Mheiriceá), Canada (Ceanada) and Australia (an Astráil). According to the 1996 census, 1.43 million people in Ireland claim to have some knowledge of Irish, 353,000 of whom speak it regularly. The main concentrations of Irish speakers are in the Gaeltachtaí, which are scattered mainly along the west coast of Ireland and have a total population of 82,715, 76.3% of whom speak Irish. 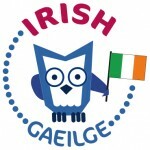 An interesting fact about the Irish Language is that it is taught in schools as the primary language with English as its foreign language, along with Wales it remains a schooling system that only introduces modern foreign languages such as french,german and spanish at a much older age.